Ditching indiscriminate electric saws for an open-eyed and utterly poetic response to intention and context, the Hayes Residence shows us how to build with conscience and charm. Travis Price Architects create a modernist intervention that doesn’t just impress itself onto the land but moves gently across it, delicately rising out of it. 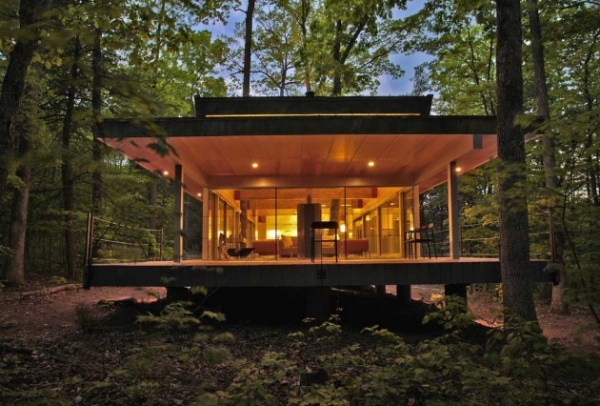 This glass forest home is located in Berkeley Springs, West Virginia on a yet untamed trail through the woods. Standing on path to nowhere, a romance with the wild is encapsulated in transparent, open planned cuboidal volumes, held steady between two consolidated horizontal surfaces. Stone steps elevate to the main level that floats lightly above the forest floor; its smooth grey tiles exaggerate the enclosed space and its dimensions through color and scale. The wooden ceiling above creates subtle zoning in the open layout through beam, volume and geometry. This glass forest home is organized into two clear cores – a living – dining area and a private sleeping quarters, each with their own associated service and ancillary spaces. An open courtyard with towering trees creates a spatial and functional buffer between these cores. This interaction with the forest extends into the living-dining core where individual trees punctuate the volume, wrapped sinuously in glazed columns that preserve the integrity of this space. 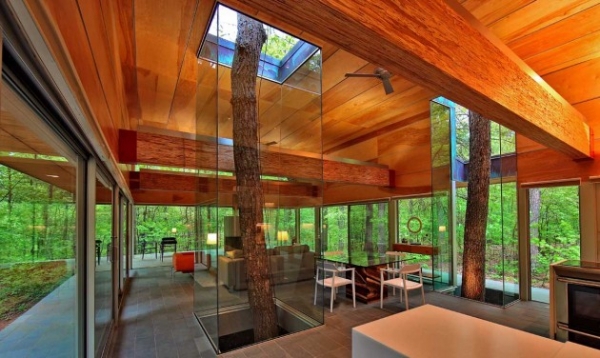 From drawing to detail, this glass forest home celebrates nature – inside and out, creating an updated dialogue between forest and frame.